NEW YORK, NY--(Marketwire - February 2, 2010) - The global hunt for The 39 Clues®, the New York Times bestselling multi-media adventure series that combines books, collectible cards and an online game, continues with the release of "Book 7: The Viper's Nest" by Peter Lerangis, in stores today. With the publication of this new installment, one of the key mysteries in the series -- which branch of the Cahill family Amy and Dan belong to -- will finally be revealed. Also today, Scholastic releases "The 39 Clues Card Pack 3: The Rise of the Madrigals," a new wave of randomly assorted collectible game cards, to span Books 7 and 8, plus the simultaneous audiobook edition of "The Viper's Nest" which includes exclusive bonus material. With the release of "The Viper's Nest" and "Card Pack 3: The Rise of the Madrigals," six new Clues will be revealed, bringing a total of 28 Clues unveiled to date. As the race to find clues intensifies, author Peter Lerangis will embark on a national book tour where fans will have a first-hand look at this interactive reading experience that has captivated kids and educators from all 50 states and 191 countries. The tour, which starts today and features events in schools, bookstores, and libraries, will be supported by targeted advertising for teachers on Facebook and various online outlets. Additionally, Scholastic will promote The 39 Clues via print, television, in-theater, and online advertising in key markets including New York, Los Angeles, Chicago, Philadelphia, Dallas, and Boston, garnering more than 10 million total impressions. Scholastic Media recently launched the The 39 Clues Madrigal Maze App for the iPhone™ and iPod touch®, which has been ranked among the top "Paid Kids Games" on the App Store since release. Beginning today, in conjunction with the release of "The Viper's Nest," the company will offer the app for $0.99 for a limited time only. Scholastic Media also recently announced that it has teamed up with Post Cereals for a "Race to Win" Sweepstakes to bring the adrenaline-charged book series to 4 million specially marked cereal boxes. National print advertising and additional branded content supports an instant win game at www.Post39CluesRaceToWin.com. There are more than 6 million copies in print for books 1-7 in the series. Worldwide interest in The 39 Clues continues to grow, with the online game drawing new readers and gamers totaling more than 855,000 registered users to date. The series has been licensed for publication in 20 languages including Japanese, Italian, Chinese, German, Greek, and Hebrew. The 39 Clues launched on September 9, 2008, with "Book 1: The Maze of Bones" by Rick Riordan, which debuted at #1 on the New York Times bestseller list. On December 2, 2008, "Book 2: One False Note" by Gordon Korman was released and also debuted at #1 on the New York Times bestseller list. Since then, the series, including "Book 3: The Sword Thief" by Peter Lerangis (March 3, 2009), "Book 4: Beyond the Grave" by Jude Watson (June 2, 2009), "Book 5: The Black Circle" by Patrick Carman (August 11, 2009), and "Book 6: Beyond the Grave" by Jude Watson (November 3, 2009), have appeared on the New York Times, USA Today, Publishers Weekly, and Wall Street Journal bestseller lists. Movie rights for The 39 Clues have been acquired by DreamWorks Studios with Steven Spielberg eyeing to direct. The script is being penned by Jeff Nathanson whose credits include "Catch Me If You Can" and "Rush Hour 2." The 39 Clues is a groundbreaking multi-media adventure series for children ages 8-12 that spans 10 adrenaline-charged books, hundreds of collectible game cards, and a website that allows readers to play a role in the story and compete for prizes. The series centers around the Cahills -- the most powerful family the world has ever known. But the source of the family's power has been lost. Grace Cahill, the last matriarch of the Cahills, changed her will minutes before she died, leaving her descendants an impossible decision: receive a million dollars or a clue. The first Cahill to assemble all 39 clues hidden around the world will discover what makes the family so powerful -- a reward beyond measure. It's Cahill versus Cahill in a race to the finish, with readers hot on the heels of the main characters, fourteen-year-old Amy Cahill and her eleven-year-old brother, Dan. The series highlights famous historical figures kicking off with Benjamin Franklin in "The Maze of Bones," Wolfgang Amadeus Mozart in "One False Note," Toyotomi Hideyoshi in "The Sword Thief," Howard Carter in "Beyond the Grave," Anastasia Romanov in "The Black Circle," and Amelia Earhart in "Beyond the Grave." 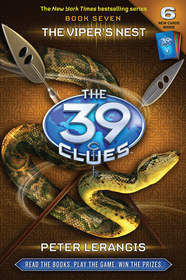 For more information about The 39 Clues, the remaining books in the series, and to download digital images, visit http://mediaroom.scholastic.com/The39Clues.